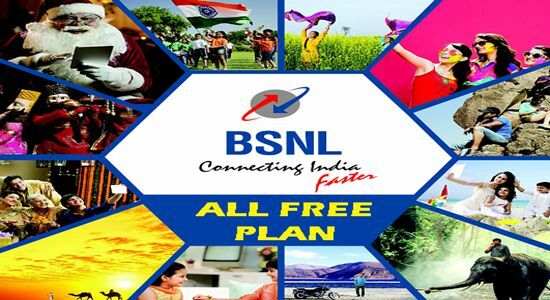 Leading 3G network provider BSNL has announced the launch of ‘All Free Prepaid Mobile Plan 149’ for Prepaid mobile users under GSM mobile services in all telecom circles. State run Telecom Company Bharat Sanchar Nigam Limited (BSNL) launches new Prepaid mobile ‘ALL FREE PLAN’ which will be exclusively available for BSNL Broadband customers in all Telecom Circles from 1st January, 2017 onwards as promotional basis for a period of 90 days. As per latest information, BSNL Competent authority has decided to introduce new scheme for Prepaid users for upcoming New Year 2017 across India. Thus, launched Unlimited Free calls to any network offering special Prepaid plan named ‘ALL FREE PLAN’ which comes @ 149/-. New Prepaid user plan voucher of Rs.149/-, offers Unlimited Free voice calls to any network for both Local/STD in India with 180 days validity. Broadband customer have to submit Original/last paid bill at nearest BSNL Customers Service Center providing existing BSNL mobile connection number. New Broadband customer can also get this scheme with All FREE PLAN voucher after verifying the guidelines of active broadband connection. The customers having BSNL Broadband connection but not BSNL mobile connection and having other operator number can avail by Port-in to BSNL network through MNP (Mobile Number Portability). BSNL will issue only one Prepaid connection under ALL FREE PLAN against each active Broadband connection. Customer should note that this plan will be activated only through BSNL Customer Service centers exclusively. However, BSNL will be offering unlimited free calls for the first 30 days after the activation. After completion of promotional 30 days period all local and STD calls will be charged @ 80 paisa per minute. SMS charges will be @ 50 paisa per SMS and data usage charges will be 3 paisa per 10KB without using STVs. The above Offer will be implemented with effect from 1st January, 2017 and will be available for a period of 90 days in all Telecom Circles as promotional basis under Prepaid mobile services.